Problems when troubleshooting printed circuit board assemblies add cost and delays to any project. The Logical Company, a specialist in high-performance computing systems, has overcome the challenge by testing production units with XJTAG boundary scan. XJTAG enables Logical’s production team to pinpoint any failures and repair boards quickly and efficiently. 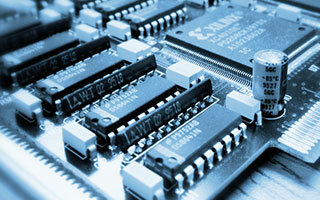 Logical has in-house surface-mount assembly capacity, and also uses contract manufacturing services. Boards typically contain large FPGAs and other high-density BGA devices as well as the latest-generation DDR and Flash memories, SRAM and ARM® processors. They are high-value units, built in low volumes, and any that fail end-of-line test are usually repaired rather than scrapped. Conventional test techniques often cannot provide the information technicians need to troubleshoot boards that have failed testing. In the past, Logical’s engineering department has taken responsibility for diagnosing boards that cannot be repaired on the production line. “We needed a strategy capable of handling all failed units on the production line, to avoid the delays and extra expense of returning boards to engineering”, explains James Wellington, System Analyst at Logical. Logical’s solution has been to implement boundary scan testing, using XJTAG. Boards are quickly connected to the test system using an edge connector, without requiring access to pads, pins or test points. Hence there are no test access challenges, and most types of component can be tested – not only boundary scan devices but also those attached to them. The XJTAG system has powerful features to maximize productivity. These include graphical tools for setting up boards, viewing layouts and schematics, and exploring connectivity between devices. There is also an Advanced Connection Test that supports clickable links allowing faults to be easily visualized in the Layout Viewer. “The ease of project setup and the ability to isolate problems using the Layout Viewer are two of our favorite aspects of the system”, offers James Wellington. XJTAG support has been phenomenal. The demo board and files helped us understand the tools quickly, and the personal assistance provided to guide us through the process and help us configure our more complicated PCBs was above and beyond normal expectations. The ease of setup and the ability to isolate problems using the Layout Viewer are two of our favorite aspects of the system. Our experience has been so successful that we intend to use boundary scan for 100% of our products. We are also planning to extend XJTAG testing to enable our contract manufacturing partners. The Logical Company, based in Oregon, USA, designs and produces specialized high-performance computer boards for applications such as communications systems, industrial controls, test equipment, and enterprise workstations. The company has particular expertise in replacement and migration hardware, which allows users to benefit from the latest technologies without sacrificing investments in existing equipment or software.